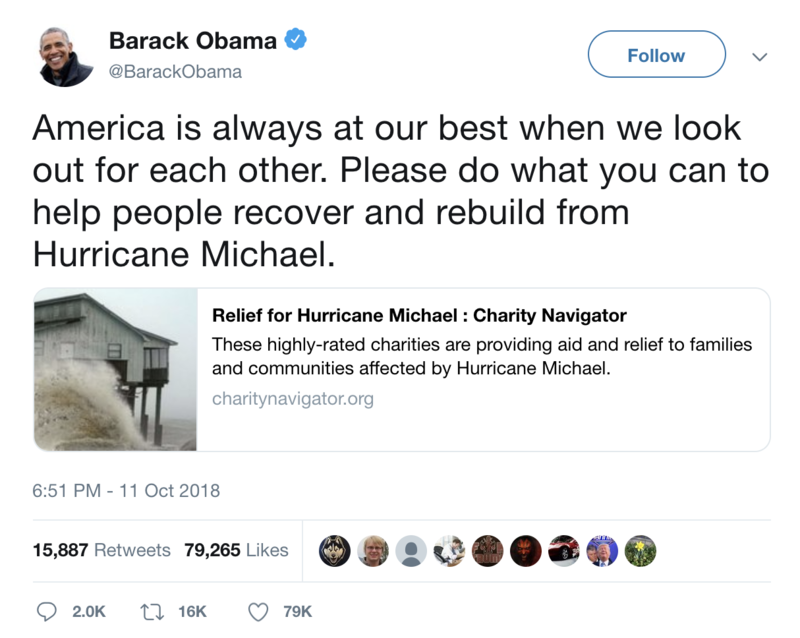 GLEN ROCK, N.J. (Oct. 12, 2018) — Former President Barack Obama urges Americans to give in the aftermath of Hurricane Michael by sharing the link to the relief organizations vetted by Charity Navigator for Michael. This list of twenty-five highly rated charities includes Feeding the Gulf Coast, SBP, and Americares. Charity Navigator, www.CharityNavigator.org, is the world’s largest and most-utilized independent charity evaluator. The organization guides informed giving by evaluating the Financial Health, Accountability and Transparency of charities and by providing data about 1.8 million nonprofits relied upon by over 11 million people every year. Charity Navigator does not charge the organizations it evaluates, ensuring unbiased evaluations, nor does it charge the public for this trusted data. As a result, Charity Navigator, a 501(c)(3) public charity itself, depends on support from individuals, corporations and foundations that believe it provides a much-needed service to America's charitable givers.